High streets may be suffering in these times of austerity, and a new report suggests traditional markets are faring little better. The survey into the state of UK markets by The Market Alliance concluded that "trading conditions are tough". In the West Midlands, figures were slightly more pessimistic than the national average. Comparing how they thought business was in March 2011 with March 2010, 19% thought that it had improved, while 43% of respondents thought that things had deteriorated. But some markets appear to be weathering the storm better than others. People have been buying their fruit and veg from the Market Hall in Shrewsbury since 1965 - but in recent years it had seen a decline in customers and traders. But since Shrewsbury Town Council took over much of the running of the building two years ago, there seems to be a real buzz about the place. It has just been named as the best council-run indoor market in the country by the National Association of British Market Authorities. "There's a really different ethos to what the market used to be," said Sam Pooley, a "mumpreneur" who runs a children's art stall at Shrewsbury. "It's a completely changed demographic, so the customers are completely different. "The people who walk through the door now are not just of pensioner age, coming to get their Sunday roast. "Either it was the very affluent coming in to buy good meat and fish, or it was the older generation who traditionally came in to use the market. "Now we've got three funky eateries in here. "We've even got a cool oyster and champagne bar." She said that a big change had been improved facilities for children. "We've got Compost Kids doing art workshops on one side, we've got Katie's Kitchens on the other side doing kids' cookery classes. "I've got lots of yummy mummies coming in. "And they don't just come in to do the classes - they'll come in three or four times a week and have lunch at one of the various places. "We even had a yummy mummy's dad come in on Saturday to do a weekly shop." In Staffordshire, "mumpreneurs" are in short supply at Leek's outdoor market. Market Place is in decline - it has room for 76 stalls, but only around 20 regular traders are using them on market day. It is losing Staffordshire Moorlands District Council £60,000 a year, with income almost halved over the past four years. 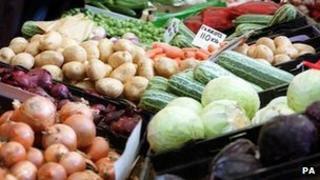 The council is looking at possible ways of reviving the market which include shoppers' surveys and a new marketing plan. Asked what the problem was, the council's markets manager David Murrell said he thought it was "a complex one" and there was "a national problem of a decline in traditional markets". "Over the past 30 odd years we've all changed the way we shop. "There's the advent of supermarkets, there's the advent of online shopping and there's a huge amount of revenue that goes that way now. "Markets are traditional and they've got to compete in an ever increasing, challenging market place overall and to do that we've got to get smarter." And elsewhere in the council's patch, Cheadle's outdoor and indoor markets made a loss of more than £30,000 in the same period. Mr Murrell added: "[We're] looking at how other markets around the country have made successes out of what were declining areas." The council could do a lot worse than look over the county border to Shropshire. Cheadle outdoor market has one regular stallholder; Shrewsbury has a waiting list of 60 people wanting a piece of the action.